The Pier to Pier is a point to point race from the pier on Sandhaven beach in my hometown of South Shields to Roker pier in Sunderland. 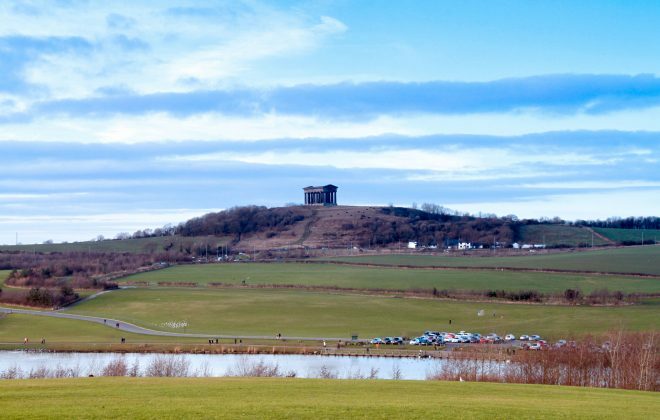 It is exceptionally well organised by local running club Sunderland Strollers, and for the last three years that I’ve been running it, has always has good spectating weather! 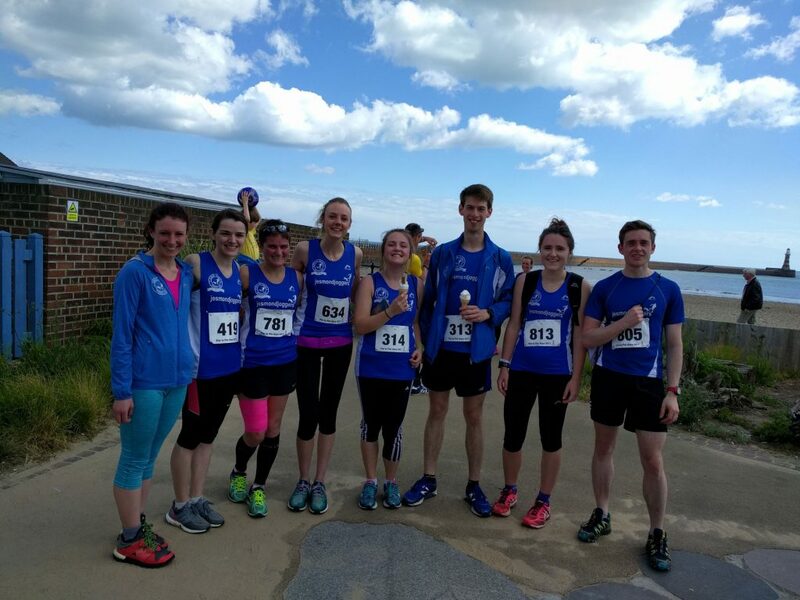 The race always proves popular with local runners and the 2017 running was no exception, there were no entries on the day this year with 1,274 runners registered in advance (1,177 would finish). Jesmond had nine runners represented at this years Pier to Pier, an increase from one in 2015 (me), and three in 2016! 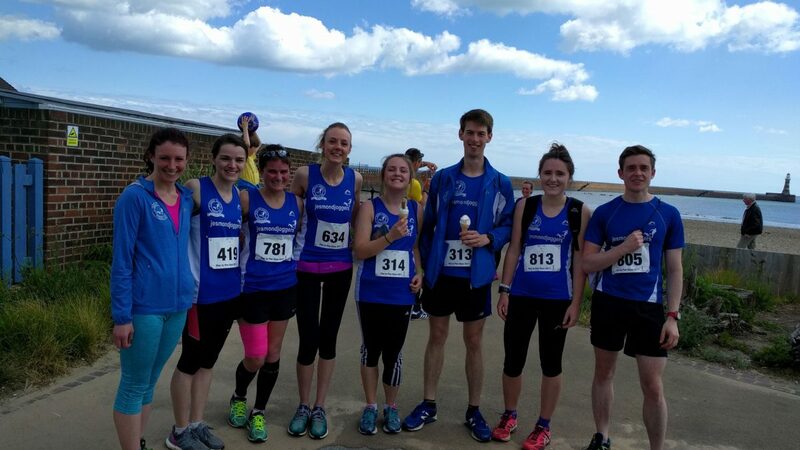 The Jesmond senior ladies put in a storming performance, with three in the top ten including Catherine in eigth place who decided to do an eight mile warm up from the Yacht club in Roker to the start in South Shields as part of her marathon training. I decided to stay at my mam’s house in South Shields, which made for a short 15 minute warm up jog in the morning instead of battling with Sunday service on the metro from Newcastle. This meant that I was fed far too much pasta, (the best running fuel) some ice cream (or is this the best running fuel?) and some delicious lemon drizzle cake. I then proceeded to take a (planned) powernap on the sofa which was in no way caused by the copious amount of carbs. The morning of the race rolled around, a couple of coffees and a bowl of porridge prepared me for a leisurely jog to the start and a mingle with fellow joggers. The weather was already warm, which would at least mean the grass and coastal path would be compact and easy to run on. The start is on the beach, and as such is able to wider than it is long with most people trying to get on the side closest to the sea with the wet compact sand. There were a couple of film crews this year, and a drone. There has been a short trailer released from those guys and you can find it on the photographer’s Twitter account. Running on the beach is initially quite easy, until you have to get onto the dry sand at the far side of the beach when it feels like you’re running through, well, quicksand! Next is a sharp ascent to the cliffside coastal path, and the quickest route is to cut straight accross the headland, but the leader (and eventual winner) Abraham Tewelde kept following the coastal path and ended up about ten positions back when he rejoined the rest. The grass was compact, but uneven in parts and it proved technical as a Sunderland Stroller in front of me took a hard tumble to the ground, I asked him if he was alright, he seemed fine and I kept moving thinking that I’d done my good dead for the day! The field advanced towards Souter Lighthous, where the only option is to follow the coastal path, and where thousands of flys decided to ruin my view and cause me to trip and twist my ankle. Thankfully it didn’t hurt too much and I could keep running, but it certainly knocked me! At the end of the coastal path, it’s back onto the beach for a short uphill section and onto the promenard, arguable the fastest part of the race, but with six tough miles in the legs it’s not easy to get any speed up! The finish is on Roker beach and was a welcome sight, I finished one second slower than my time in 2015, good for 18th Position. The highlight of the race however is the goody bag, no cotton t-shirts or free samples here! A full-size mars bar, bag of crisps, a custom mug and a dry bag. And of course a home-made keepsake of Souter lighthouse. 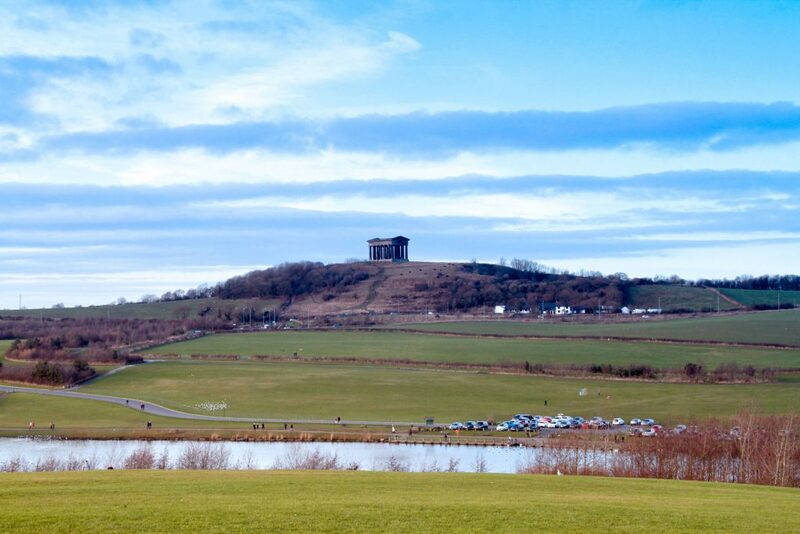 Jesmond Joggers Running Club is a relatively small, but very friendly, running club. For more information please email the Club via our Secretary at jesmondjoggers2006@gmail.com. Alternatively pop along on a Monday or Wednesday at around 6.45pm or contact Jesmond Community Pool on 0191 2812482.